Ages 18+. Ticket price includes performance, canapes on arrival, a sumptuous three course french inspired menu with premium Marchand & Burch Wines. Pre-dinner drinks and canapes from 6.00 pm, 6.30 pm dinner, show commences at 7.30 pm. Step into a lively Parisian jazz-club evening with vocalist Cathrine Summers (Perth/UK), back with another Summers Night in Paris after its sell-out debut at the Paris Cat last year. Come and get lost in the magic of Paris with an incredible authentic evening of French classics, jazz greats, amazing internationally performers. Expect to hear songs such as Ella Fitzgerald’s ‘April in Paris’, Edith Piaf’s ‘Non, Je Ne Regrette Rien’ and many more, all weaved around a rich musical history of love and Paris in the 30s. 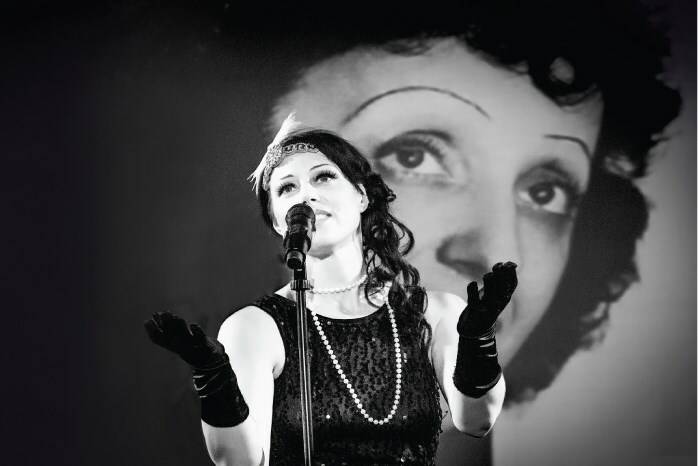 Enjoy a celebration of the wonderful Edith Piaf, Cole Porter, Charles Trenet, Josephine Baker and Parisian Cabaret eras in this Fringe Festival Award Nominee show with Cathrine and her Quartet. The celebrated singer, known for her incredible accent or, to the French, for not having an accent has an engaging ‘instantly familiar’ onstage persona which, coupled with her rich honeyed voice will draw you in and leave you wanting more. The UK-born artist spent much of her time living and holidaying in France where she fostered a love of the French language and a deep appreciation of the countries passionate history and romanticism and shares much of this love in this warming toe-tapping evening.